» A LOCKED ROOM LIBRARY, by John Pugmire. Over the past six weeks or so I�ve been working with John Pugmire, a long-time �locked room� aficionado, and the English translator of Paul Halter, the French writer who specializes in the genre, on an article about guess what? Locked room mysteries, of course. To tell you the truth, John�s article has been done for most, if not all, of these same past six weeks. What�s been holding up the works has been me. The major part of the piece is a list of well over 100 locked room mysteries. What I�ve been doing in my spare time in the evening is adding cover images to something like 90% of them. �Over twenty five years ago, Ed Hoch asked seventeen authors and critics to rank the best locked room mysteries of all time. 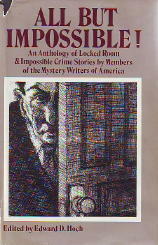 The results were published as an introduction to the anthology All But Impossible (Ticknor & Fields, 1981). �Early in 2007, Roland Lacourbe, the eminent French expert on impossible crime fiction, decided to ask a group of fellow anthologists and translators to name 99 novels worthy of inclusion in the library of a hypothetical locked room aficionado. The results can be found in this article Steve has just told you about. Also in the piece I offer some thoughts on French Golden Age crime fiction and how it was influenced by the criminal justice system. If you�re a fan of classical mystery fiction, harking back to the Golden Age of Detection, I think you�ll like what you see. In fact, I guarantee it.